This seems to be a known issue with an upgrade from 1709 to 1809. Windows had a service called Tile Data Model Server in 1709 which was removed in the later version of the OS. Though the service was removed it seems that the subscription information for the Profile was not removed. Hence whenever the load/unload of the profile happens, the user profile service tries to reach out to the service which is not existent. Hence the error. This issue does not occur if we have a clean build of 1809. *I confirmed with MS Support that this workaround was ok. I provided my script to them, and they said it was good. 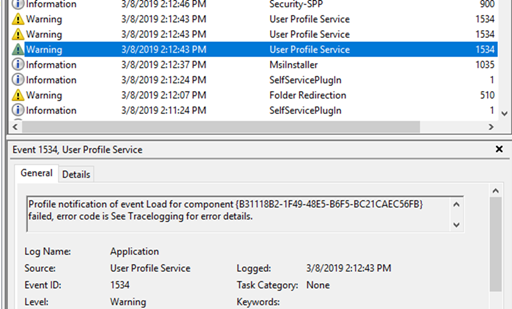 Problem, you can’t just delete them, you need to take ownership, add permissions, then delete.. so two lines of code become much longer.. especially when you add logging..
Log File: I have it save to the ccm\logs directory. 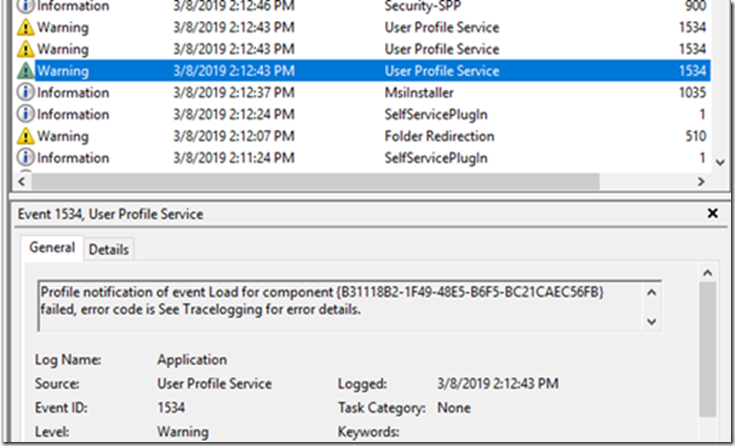 I have a log SMSTS_PostActions that I log many of my Task Sequence scripts to that happen post upgrade, this gets appending into that log. $Time = Get-Date -Format "HH:mm:ss.ffffff"
$LogMessage = "<! [LOG[$Message $ErrorMessage" + "]LOG]!><time=`"$Time`" date=`"$Date`" component=`"$Component`" context=`"`" type=`"$Type`" thread=`"`" file=`"`">"
# After you have set owner you need to get the acl with the perms so you can modify it.